a mobile Xamarin client running in either simulator or on a device. Xamarin Studio, primarily because of the licensesing cost, but also to challenge myself with OSX and Xamarin Studio. Based on this setup I'm hosting windows in a virtual machine using Vmware Fusion, with Visual Studio. And most of the time this will be where my mobile backend will be running during development. The basic key to consume a window hosted API from OSX is the network setup. With VmWare Fusion, It's pretty easy, using a network bridge. Inside this menu select Bridged Networking and the Wi-fi option. With this enabled it's now possible to consume a VmWare Fusion hosted Windows WebAPI from Xamarin running the client on OSX. While it's pretty easy to make the network bridge between OSX and Windows, the next bump on the road during development is Application Transport Security, (ATS - NSAppTransportSecurity). 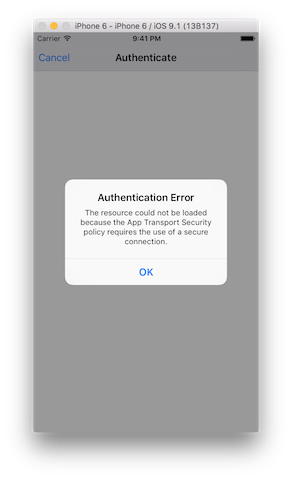 Since IOS 9.0, Apple by default requre all communication to be secure, meaning https. As all projects starts small, this would be a bit of pain, and luckily there is an option to avoid this while developing on your local machine. but only if you taget IOS 9.0 or above. in the Xmarin.ios project in your solution. Locate the file and select the source tab in the bottom of the file. Add a new entry to the file, either directly in Xamarin Studio, or in another text editor, this is just a plain xml file. the lack of insecure communication.